Tsaritsa Natalya, Patriarch Andrian, and his tutor Zotov. For Greek-speakers, Vlach-speakers and Arvanitic-speakers this much was obvious, that Romiosini was always bilingual, with Latin initially as a language of the administration, and Greek as the written language. This bilingualism was maintained for 500 years before Constantine the Great moved the capital of Romiosini from Old Rome to Constantinople New Rome. For this reason eventually the same name was maintained, with Latin being called "Romaic" and Greek being called "Romaiic". That is, the same name with one iota (i) meant Latin, and with two iota's (ii) meant Greek. Vlach is Neo-Latin and Arvanitic is a mixed language primarily of Latin and Greek. Hence it was always the case that Vlach-speakers, Arvanitic-speakers and Greek-speakers were called Romans. It is complete nonsense for us to agree with the propaganda of the Great Powers that during the Turkish occupation the name Roman only had religious significance and not national. From the 11th century, when the Frankish occupiers of Italy banished the Romans from the Patriarchate of Old Rome and changed this Church into a Frankish one, Greek was maintained as the official language for the unity and administration of the Romans, and this was maintained during the Turkish occupation. But those who spoke Bulgarian would say and believed that they also were Romans and took care for their children to be educated in Romaiic. To many old Greeks this may seem strange, or unbelievable, or unacceptable for the sake of national authenticity and dignity. But why is it strange and unbelievable? How did it happen for so many people to gather together in America and become an American nation in 100 years, yet after so many centuries those provincially called Serbs and Bulgarians did not become Romans? Only when one has in view these authentic historical events will they be able to accept what the Ecumenical Patriarchate was within the Ottoman Empire, and why Russia eventually accepted the view of the Europeans that the Patriarchate must be dissolved. There came to Russia a change in the core of its civilization, especially from the time of Tsar Peter the Great, who died in 1725, which was 100 years before the revolution of 1821. This tsar proclaimed war against the civilization of Romiosini, which the Russians had received from Constantinople, and replaced it with the civilization of the noble Franks of Europe at the time. This event had as a result of making the sacrifice of 1821 on behalf of Romiosini to become a sacrifice to uphold the Frankish civilization of the new state of Greece. After the assassination of Kapodistrias there was no doubt among the Romans that they were liberated from the Turks in order to be enslaved to the Franks. The theological westernization of Russia began around 150 years before Peter the Great, which was 50 to 70 years after the Fall of Constantinople, and took a definitive theological form with the founding of the Kiev Theological Academy in the 17th century. From this Theological Academy Peter the Great took his policies to westernize the Russian Church. In order to achieve westernization to the core, Peter the Great transferred his capital from Byzantine Moscow to a new city which he founded and called Petrograd, today's Leningrad [now commonly called St. Petersburg]. The churches of Leningrad are purely of the western architectural style, primarily Baroque. Also its cathedral church, which today is used as a museum for atheism, is very much like Saint Peter's in today's Rome. It is important to note that the churches of Leningrad have Italian icons, as well as statues on the icon screens. 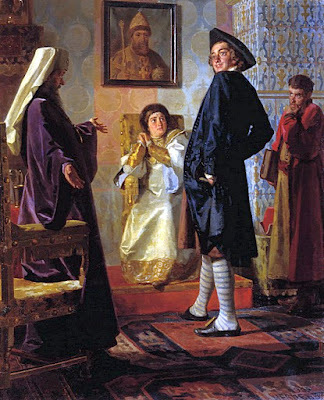 From the time of Peter the Great there began a systematic uprooting of our Byzantine music and iconography throughout Russia, and its replacement with Italian music and iconography. In other words, theological change brought a change in architectural style, iconography and music. What had happened to Russia never happened to Romiosini within the Ottoman Empire, which covered the Balkans, the coast of the Black Sea, and the entire Middle East. Western influence appears on the seven Ionian Islands during the Venetian occupation, but not in Venetian-occupied Crete. With the creation however of the new Greek state things suddenly changed.